Chattanooga is a popular summer travel destination because of the outdoor activities around the city. Add to that dining, as the Scenic City’s culinary scene includes lots of restaurants that offer rooftops, decks, and patios to enjoy the fresh air. Chattanooga’s combination of delicious cuisine and inviting outdoor spaces are sure to delight any culinary connoisseur. Here are some of our favorite outdoor dining destinations. Chattanooga’s only German-American gastropub, Brewhaus pairs classics like schnitzel, egg noodles, and brats with German-inspired beer and wines. 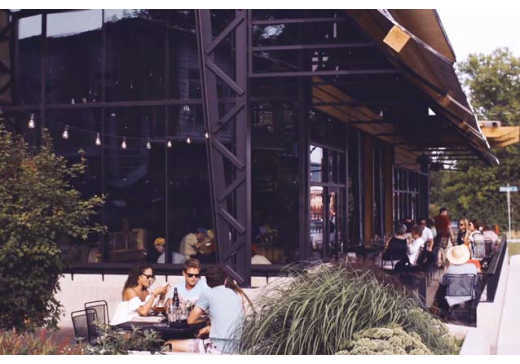 Brewhaus is best enjoyed on the covered porch overlooking Coolidge Park or the sunny outdoor patio. Taco Mamacita is a casual taco fusion joint in North Shore. Try house-made nachos, enchiladas, or Peruvian chicken. The dishes are made with local ingredients and pair well with a hand-mixed drink. Enjoy your meal on the low-key patio that always attracts a crowd. A Chattanooga staple since 1982, the Pickle Barrel is the place to go for burgers, sandwiches, and, of course, enormous fried pickles. The second story patio feels like a tree house in the middle of downtown and is the perfect place to people watch. Flying Squirrel is an award-winning establishment in the newly revived Southside neighborhood. Their house-made, locally sourced dinners and drinks are as well designed as the custom building. Enjoy duck fries and a cocktail or linger over Sunday brunch on the comfortable modern terrace. If you want to sip hand-roasted, seasonal coffee among exposed brick walls, look no further than Mean Mug Coffeehouse. Enjoy the eclectic, private courtyard as you drink local Velo Coffee Roasters coffee with artisan pastries. You can also grab breakfast or lunch. Chattanooga’s historic Seed-Feed Supply Co. now houses The Feed Table and Tavern. You’ll find creative, farm-fresh staples like the short rib "pot roast" or the Tremont burger. The elegant yet rustic deck features live music every Thursday, Friday, and Sunday. In the heart of Southside, Alleia specializes in creative interpretations of rustic Italian cuisine. Savor hand-made pasta dishes, Neapolitan style pizza, and antipasta on the serene porch that features climbing Jasmine and views of Lookout Mountain. Find American-Italian dishes made with carefully sourced, local ingredients at Il Primo in the Riverside neighborhood of north Chattanooga. The shaded, plant-lined patio complements the classic, made from scratch dishes as well as the superb selection of Italian and American wines. Public House pairs the best aspects of upscale restaurants—local ingredients, excellent service, and a great wine list—with a low-key atmosphere and reasonable prices. Enjoy high-quality fish and steaks and a rotating selection of seasonal vegetables on the spacious patio in Warehouse Row. 1885 specializes in fresh seafood, quality steaks, and house-made sides with a Puerto Rican twist. Meticulously prepared dishes like NC rainbow trout and shrimp and crawfish étouffée are made from fresh, local ingredients. Enjoy your dining experience on a patio set in the beautifully revitalized St. Elmo neighborhood. You’ll try The Terminal Brewhouse for craft beers and locally sourced food, but you’ll stay for the historic building’s infectious atmosphere. Sample exclusive creations like beer cocktails, house infused bacon vodka, and cucumber infused gin. The laid-back second floor patio overlooks the lively Chattanooga Choo Choo, making it a Friday night favorite. Stir brings a refined focus to Chattanooga’s craft cocktail scene. Enjoy your painstakingly crafted drink with artisanal ice. The restaurant’s modern aesthetic blends well with the historic bones of the iconic terminal station, the Chattanooga Choo Choo. Dinner and drinks are best enjoyed on the spacious patio in the heart of Southside. A hidden gem in the downtown Bluff View Art District, Tony’s Pasta Shop and Trattoria serves house-made Sicilian dishes in a casual setting. Pair your meal with Italian wine and relax on the patio with a view of the Tennessee River. Another staple in the Bluff View Arts District, the Back Inn Cafe is a casual fine dining restaurant set in a colonial revival mansion. Enjoy duck breast or Ahi tuna and an extensive wine list on the elegant garden terrace overlooking the Tennessee River.